Last week the USD continued to strengthen due to positive US macro-economic statistics; however the pair EUR/USD was not able to consolidate below the level of 1.2400. The data on the US retail sales and consumer confidence index have exceeded the forecast; while the increasing number of applications for unemployment benefits has slightly spoiled statistics. As a result, the pair finished the last week reaching the level 1.2520. At today’s opening session the pair at first continued to rise, but then fell to support level of 1.2490. In the afternoon, Mario Draghi, a chairman of the ECB, will give a speech, which can shed light on the future policy of the regulator. On Wednesday, final minutes of the US Fed meeting will become known. On Thursday, US consumer price index will be released. Technical indicators show that the pair has broken through above the level of 1.2500, which could have become a signal of trend reversal; however the price at once underwent downward correction. If the pair does not consolidate above the level of 23.6 Fibonacci, it will again test the bottom limit of the channel at the level of 1.2400. Support levels: 1.2485, 1.2460, 1.2440, 1.2420 and 1.2395. The main target of the “bears” is to go below the level of 1.2485. Resistance levels:1.2500, 1.2525, 1.2550 and 12580. 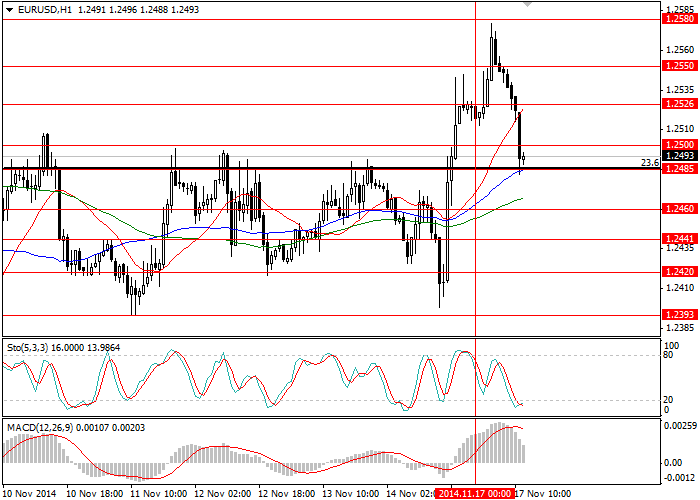 It makes sense to open buy positions from the level of 1.2500 with the target of 1.2580. Sell positions can be opened below the level of 1.2485. it is also advisable to place limit buy orders at the level of 1.2395.